Size: 6" x 8 1/4"
Second, revised and expanded edition. 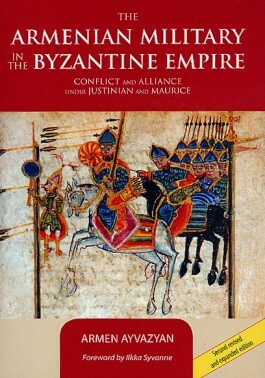 This book brings to light one of the least known, yet most turbulent periods in the history of the Armenian military and its complex relationship with the Byzantine Empire. In its first part, Armen Ayvazyan embarks on a military-historical analysis of the Armenian uprising against Emperor Justinian’s government in 538-539. While revealing and evaluating various tactical elements and stratagems employed by the Armenian forces, he carefully considers earlier and later evidence regarding their military operations, including both conventional warfare and high risk missions such as targeting killings of enemy commanders-in-chief and assassination plots against the heads of colonial administrations. And in the second part, Ayvazyan examines the Byzantine attitudes towards the Armenians and their armed forces, revealing, inter alia, that the underlying source for continuity of the anti-Armenian images with the analogous Roman tradition of prejudice was essentially geopolitical.